I would love to invite you to our iGen and Leadership training day that is being held on Saturday 9th March, 10-2pm at Kingsbridge Methodist Church. 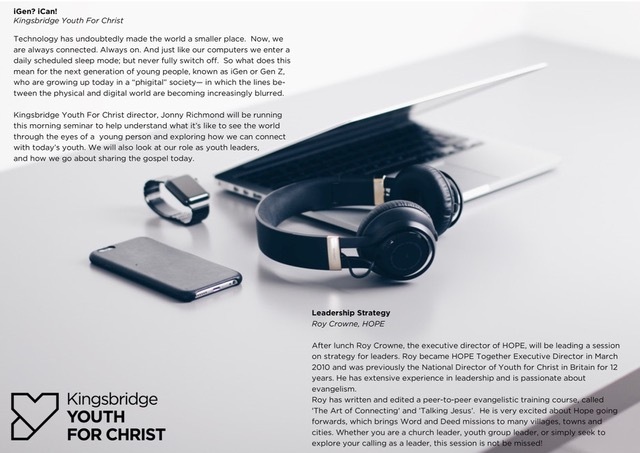 It is open anyone interested, but particularly designed to help and equip those involved with youth work and young people in the local church. Please spread the word and come along! The day will be free of charge, and we will provide drinks and light refreshments -bring lunch if you intend to stay for the day as we will break together half way through. If you would like to book on please confirm your name and number of people to info@kingsbridge.yfc.co.uk no later than Monday 4th March. Saturday 23rd February from 10.00 am to 12 midday. Held at Brunel Manor Christian Conference Centre in Torquay. Bookings to be made through reception at Brunel Manor. For further details - click on link to the right or contact Brunel Manor directly. Opening times: The doors officially open to ‘@theLounge’ on Tuesday, October 30, and it will run every Tuesday evening during term time, from 7pm-8.30pm for school Years 7-11. Cost: £1.50 for entry with a membership card, and £2 without. First session only £1! Safeguarding: Every member of the team has been DBS cleared and received appropriate safe guarding training. Contact: via the website: kingsbridge.yfc.co.uk, or by sending an email to: info@kingsbridge.yfc.co.uk. We attended the Kingsbridge Show in the summer with Choice Words from Newton Abbott.